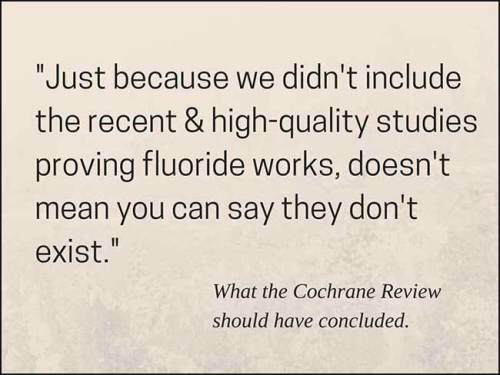 One of the worst pieces of distortion and misrepresentation of the Cochrane Fluoridation Review is that written by an anti-fluoridation journalist Douglas Main in Newsweek – Fluoridation May Not Prevent Cavities, Scientific Review Shows. It has, of course, been heavily promoted by anti-fluoride activists. Dr Charles Payet*, a dentist from Charlotte, NC, USA, has debunked this Newsweek article report in his blog article More Bad Journalism on Fluoride which is also a guest blog at Making sense of Fluoride – Ooops, [Newsweek] Did It Again. The Review judged quality using blinded randomised controlled studies (RCTs) commonly recommended for clinical drug trials as their baseline. However, they acknowledged this criteria is usually impossible to achieve in fluoridation studies because the assignment of subjects into a treated group versus a control group is outside the control of the investigator. Instead, researchers must use observational studies. Dr John Beal noted in his response to the Cochrane Health Group’s blog The value of cross-sectional studies on the dental benefits of water fluoridation – a response from Dr John Beal to the Cochrane Oral Health Group blog, the claim that cross-sectional, observational, studies, which were all excluded, are somehow of lower quality than RCTs, is false because a previous Cochrane Review said they’re similar! Well now, isn’t that interesting? The previous Cochrane Review specifically found that the 2 study types yield comparable results in terms of quality, but now this one says the cross-sectional ones aren’t good enough. As usual, Douglas Main ignores the previous one because it hurts his point. Admittedly, it would be nice if the Cochrane Review would apply more consistent standards in the selection and exclusion criteria to avoid confusion. *Dr. Charles D. Payet has been a full-time practicing dentist in the city of Charlotte, North Carolina since graduating from the UNC Chapel Hill School of Dentistry in 1998. He blogs on the science and art of dentistry for all ages with a skeptical eye atwww.SmilesbyPayet.com and has recently published several articles on the safety and efficacy of fluoride in community water fluoridation, toothpaste, etc.